Kimberley and NT News: Bushfires, seasonal closure dates, and reader feedback and trip reports. To unsubscribe or change your address please use the links at the bottom of this message. To contact me please use the contact page. To sign up for this newsletter and receive the free Kimberley Pocket Guide go here. October is on our door step and the Kimberley season is definitely moving towards an end now. I had a few reader emails asking if it's even worth going in October, so let's look at what has been and will be happening in the Kimberley. During September bushfires have caused road and park closures, as often happens around this time of the year. The Spring Creek access to Purnululu was closed between 12. and 16. September. Then the northern part of the park closed on 19. September. Emma Gorge also had to close due to fires, it reopened a couple of days ago. Even the highway south of Broome was closed temporarily. Most disappointingly, according to the authorities none of those fires have been lit by lightening. Obviously the conditions this time of the year are very dry therefore fighting the fires is a difficult task. (If you need detailed, current information about warnings and road closures, this page collects all the alerts. So, with everything so dry, is it even worth going in October? Yes, especially if this is the only chance you have to go, I do think it is, as long as you are aware of what to expect and can accept that. It will be stinking hot and many waterfalls will have stopped flowing or be reduced to a trickle. But many pools are still nice, clear and cool and great for swimming, and the Mitchell Falls and the falls at Bell Gorge and others are still flowing. Sure, nice green grass to camp on will be hard to impossible to come by. But to make up for that you'll have the campgrounds mostly to yourself! And you may get to experience the first of the amazing thunderstorms and the accompanying lightning shows that characterise the build up for the wet season. So if you think you can handle the heat, go for it! Just make sure you get detailed info on what is still open and what isn't. 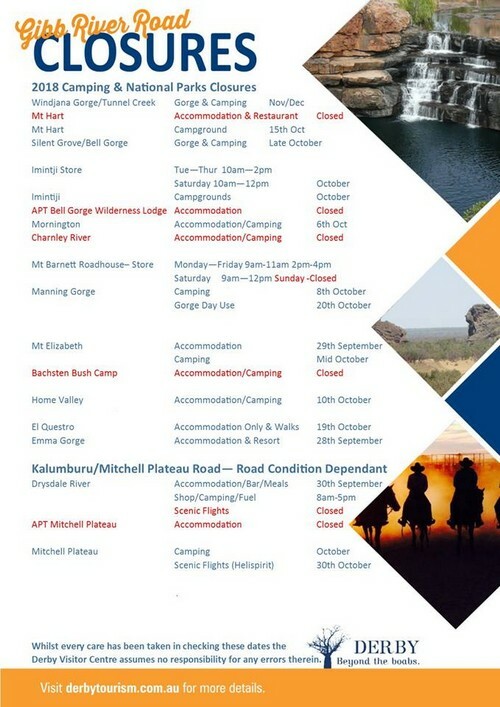 Everybody else along the Gibb as well as camping at the above will close some time in October. The closing dates change every year and are sometimes decided on the fly, so you best contact the businesses or park authorities directly to find out. Also be aware that Barnett Roadhouse is now closed on Sundays! The ever reliable and helpful Derby Visitor Centre has collated some of the available info for the Gibb on Facebook. "Firstly, thanks for an excellent guide which helped make our recent 16 days trip on the Gibb hassle free. You asked for info on staying at Mount Elizabeth Station and assuming you have not been bombarded with info, I am hoping the following might help? The station is now managed by Luke and Emma Bennett. Peter Lacey visited whilst we were there and I had an enjoyable conversation with him. He now lives outside of Kununurra. Anyway, we thought Mount Elizabeth was the most realistic station on which we stayed. It felt like a real cattle station with tourism being a sideline, unlike El Questro or Drysdale. The night we met Peter, Luke and Emma put on a BBQ for Brendan, the chef, who was returning to Perth after a 3 month stint, as well as a couple of other members of staff. Peter from Bachsen Camp came down to visit as did a number of Peter's other old friends and we, along with a Swiss couple who were the only other people staying there, were made very welcome. The ensuite cabins are snug but clean and comfortable. But not everybody was so happy with the information in my "excellent guide". 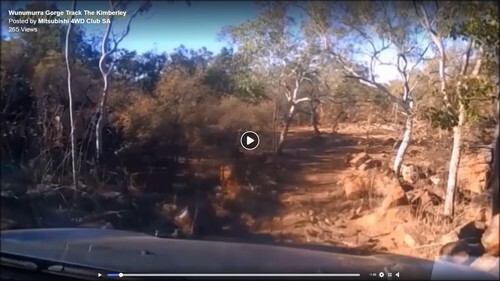 "I recently travelled into Wunumurra Gorge at Mt Elizabeth station, and believe the track in is now in much worse condition than your guide portrays. I made it to the 9 km mark and it took me 1.5 hrs including a number of stops for some track building. I got back in around 45 mins. A number of cars stopped at 7-8 km in as they were afraid of scraping their diffs on the rocks. There was plenty of evidence of this happening. If you stop at the 9 km mark the walk to the gorge takes about 40 mins. 1 km to the end of the track then 1 km to the gorge. Also Mt Elizabeth now charges guests an additional $15 to visit their gorges, (on top of the $22pp, pn camping fees) making this quite an expensive side trip." John also made a video of his drive. It is available on Facebook. "We enjoyed the trip to Wununurra Gorge. The road is horrific but we saw some wonderful aboriginal art and, as we arrived later than most, we had the place to ourselves later." "Don't get me wrong, I thought Wunumurra was an interesting place, just that the road in was much more difficult than we are led to believe." Track conditions are very variable. I read through my own description and felt that it matched what John described, except for the road building he had to do on the way in and that cost him an additional 45 minutes. Was he just unlucky to get the track at its very worst, or do you also feel it is much worse than I describe? These things can be difficult to get right for everyone. I know what I mean when I write something but can not always guess how it will sound to others. So if you've been to Wunumurra, please let me know what you think. Further along the Gibb, the enthusiastic feedback about Gibb River Station continues. "Just wanted to endorse Dave's comments about the Gibb River Station and Clyde and Lynnette. We stayed there in late July after a mishap on the GRR nearby. Their help and generosity was wonderful. The campground is 'grassed'- the amenities excellent and the shop has a small but very useful selection of items for travellers. It's only one km off the Gibb and is a great place for an overnight stopover and worth dropping in to meet two of the nicest people in the Kimberley." I don't very often hear from readers who travel on motorbikes, so I was delighted when Helen sent in this short trip report. If you are thinking of doing the Gibb on your bike you'll be happy to hear that she found it to be a great trip and highly recommends it! Peter had a not so great experience when he became bogged on a salt plain (not in the Kimberley!) after trying to help someone else to get out of that bog. However, he took the most positive approach one can take by collating everything he learned and sharing it with you. If you have had a similar experience and have something helpful to add, please do so in the comments. Paul shares his experiences and thoughts of visiting Uluru in this very well written trip report. And Karen has a difficult decision to make. Can you help her? And last but not least, something we sadly heard many, many times this season. "We've now completed the GRR. We did it the time the Kununurra locals died on the GRR. We were (free) camped a few kms from the spot on the same day and heard about it the next day on the news. That explained all the traffic we heard on the GRR that night. Tragic indeed. We too found the traffic on certain parts of the GRR to be "aggressive", i.e. people not slowing for oncoming traffic, driving all over the road, driving "too slow" and too fast. It was a little disappointing. And it wasn't all "tourists" misbehaving either. The road was fairly corrugated with deep and long corrugations. We dropped our tyre pressures to around 28psi and travelled between 60-90km/h depending on road/track conditions. We also found many places to be well patronised, some to the point of overwhelming. I guess that's tourism for you. It's no longer "outback" any more as it's so readily accessible. Our convoy of 7 vehicles were all 4WDs with offroad campers (bar 2) with plenty of outback 4WD experience and could visit any site of our choosing, but we found everything was relatively easily accessible by non-experienced drivers and non 4WD vehicles. It seems we're slowly losing the true "outback" experience as it is being replaced by the more touristy experience as the government tries to cash in on the tourist dollar. All in all it was a great experience, but I won't be doing it again in a hurry." By the way, the accident Walter referred to was covered in the last newsletter and there has been another accident since. A vehicle with French backpackers rolled due to high speed. They had to be airlifted from Drysdale with serious injuries and are apparently lucky to be alive. So even if there will be hardly any traffic now compared to the previous months, please, don't be tempted to speed. Indeed, things are changing and we are losing more and more of the true wilderness feel, with the sealing of the Cape Leveque road (see newsletter #67) currently being the most visible sign of that. "You may already have the latest info on the sealing of the Cape Leveque road. While at Lombadina last week we met an engineer helping that community submit a plan to use its equipment on the job. He said the plan was to do 30 km each year over three years, starting at the north end. The first 30 km is well under way now." According to the grapevine the full sealing of the Gibb River Road itself has already been approved. I'd say, even if that is not true, it is something that will happen sooner or later. Should you go to the Kimberley in October? Just go whenever you can, the sooner the better! If you have been or are currently travelling with one of my Destination Guides, and if you come across something that's out of date or in your opinion not portrayed accurately (see track to Wunumurra), by all means, swear at me or call me names. Without guide no information -- without information no guide! A big thank you to everyone who took the time to write to me with their feedback! Safe travels and talk again soon! Destination Kimberley, Destination Top End and Destination Red Centre have all the information you need to put together your dream trip. (c) 2005-2018, Birgit Bradtke. All rights reserved.